The Shri Ram sena today protested that the Military Farm in the Cantonment part of the city should not be closed under any circumstances. A protest rally was organised to this effect and a memorandum was submitted. 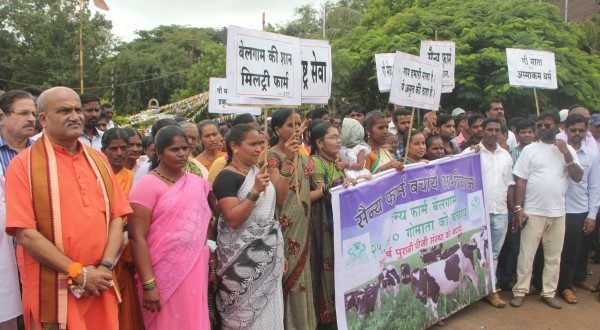 Military Farm to be closed in Belagavi as well, The Minister of Defence (MoD) has ordered that all 39 military farms in the country should shut shop within three months. Belagavi also houses the second oldest Military farm setup after Allahabad in 1890. The Military farm is situated in camp on the Rakaskop /Ganeshpur Road.For 127 years this Military farm was supplying Milk to the Army and Airforce base. Spread over vast land this dairy farm currently houses around 640 cattle and has 50 employees who look after the same. The Memorandum said that Army and the Farmers are the backbone of the country and to stop such historical farms will destroy them. If the closure order is not reversed the Sena will intensify the protest. This Ram sena, is spoiling Ram’s Name. And nothing useful. The lead of this gang is a NUT !